Women from Karakalpak and Khiva feature on volume 4 of the Aga Khan Music Initiative in Central Asia series. In collaboration with Smithsonian Folkways, the series aims to present leading exponents of Central Asia's rich and diverse musical heritage to listeners outside the region. The social tradition of music was severely ruptured during the 20th century, when society and culture in Central Asia were forcibly reshaped under the influence of Soviet modernisation. Yet much of the region's rich and diverse musical legacy survived, albeit in forms that were altered or incomplete. Today, this legacy is being actively recovered and revitalised. Bardic Divas comprises an eclectic compilation of soloists and small ensembles carrying on the oral, poetic traditions of the region. Komila Mattieva, from Khorezm, in northwest Uzbekistan, represents the cutting edge of a new generation of young women who are appropriating traditionally male performance genres. With ensemble members Dilbar Bekturdieva and Gozal Muminova, they exemplify the art of the khalfa. Khalfas are women literate in Arabic who perform a variety of religious, ceremonial, and musical functions for other women. Injegul Saburova is one of the few Karakalpak women who plays the ghirjek (spike fiddle). She learned the instrument from an uncle who, having no sons, broke with tradition and took her as his pupil. She performs with dutar player Ziyada Sheripova. 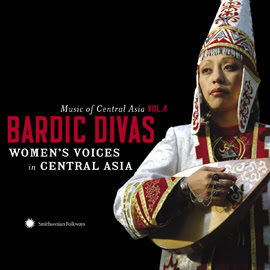 This 5-minute video clip from Bardic Voices highlights these Central Asian performers. You can learn more about this musical initiative at the Aga Khan Trust for Culture.